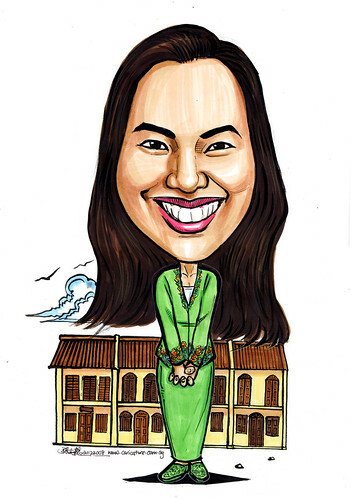 "...a picture of me wearing my Peranakan Kebaya....a row of shophouses at the background....Purpose of drawing: More to capture memory of myself at my current stage of life. The last time I had a caricature drawn was 2 years ago when I had child no. 1, now I just had child no. 2 , and thought it is a nice way to freeze-frame my current stage of life. Plus I embrace the Peranakan culture. So I thought it is a good way to merge the two together...."
The design of Peranakan Kebaya followed the photo provided by the client. "Oh!.....Ya, this is what I need!"